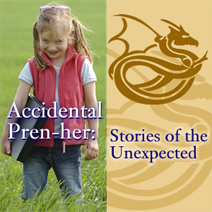 Today's special guest on The Accidental Pren-her Show, Stories of the Unexpected is Accidental Pren-her Carol McClelland. This 10 minute interview talks about Carol's impressive 16 year journey from solo-prenher to founder and managing editor of Green Career Central. Prior to becoming a successful small business owner, Carol was a Human Resource Research Analyst for a large insurance company. Now, she is launching her latest company onto the world stage. The inspiring part of this interview is that Carol never gave up. 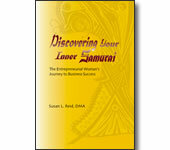 She kept persuing her dream, living her passion, and following her Inner Samurai. You can listen to Carol's interview from your computer by clicking on the play button, download the MP3 file and listening on your iPod or other MP3 listening device, or read it in full below. Welcome to another episode of the Accidental Pren-her: Stories of the Unexpected. My name is Susan Reid and we have as our special guest today Carol McClelland, founder and managing editor of her new business, Green Career Central. Welcome, Carol. SR: It’s great to have you. CM: I’m excited to be here. SR: Let’s talk a little about your journey into the entrepreneurial lifestyle. I know that at one time – actually, quite a long time ago – you were traditionally employed as a human resource research analyst for a very large insurance company. And now you’re the founder and managing editor of Green Career Central. Take us on a short journey on what that was like for you between traditionally employed to self-employed. Let’s start you off by asking when did your entrepreneurial journey begin? CM: Well, it began a long time ago, as you mentioned. In 1990, I was 29 at the time and quite burned out. A 10 or 15 minute walk put me in bed for three or four hours, and I decided that was really no way to live. And I took myself on a retreat to sort of get back to myself and what my needs were. It was just a wonderful 5-day weekend where I did exactly what I wanted in each moment. Then the very next night I had a dream about starting a stress center for women, and that was such an exciting idea to me that I just went off and started thinking about that. It actually made the last 16 months of working at the traditional job okay, because I had my vision on this bigger prize. So, after 16 months, I did launch my business. SR: It was fortunate, then, for all of us, that you had the crash-and-burn experience where your body could not just go anymore. SR: Had you ever been a small business owner before? CM: Briefly in college I did have a craft business with my mom. It wasn’t very exciting, but it did get that kind of entrepreneurial flavor started in my life. SR: Indeed. In fact, that is one of the qualities and characteristics of successful small business owners. They’ve had that entrepreneurial background. SR: Even if it was cookies or lemonade or crafts…it doesn’t matter. SR: So what made you decide to go into business for yourself? CM: Well, I did a lot of inner questioning at that point and realized that what I most wanted was to make a difference, and to be able to be in a style of work that allowed me to be myself 100 percent of the time. When I was working in the corporate world, it felt like I had to put on a mask and put on different clothes and show up in a different way. Then it would take me two or three hours every night to get back to myself. And I really liked myself. I wanted to be myself all the time! I also wanted flexibility in my work schedule so I could work with my own natural cycles, rather than force-fitting myself into somebody else’s schedule. SR: Boy, and that is such wise counsel. You knew that by putting yourself in this other position, you weren’t being your authentic self. CM: No part of it. Actually, the biggest clue that I was in trouble was about a month before I took that retreat. I would scream bloody murder, just at the top of my lungs, all the way to work and every time I had to get in the car. Luckily, it was five minute commute, but that’s not a good sign when your body is giving you so many clues that you don’t want to go there. It came out in me in this very verbal scream. It was not a very good period in my life, but, as you said, the end result was very good. SR: I really honor the fact that you recognized that about yourself. Even if you were screaming at the top of your lungs, you knew this was not the fit for you. SR: So tell us about the goal of your current business. CM: The Green Career Central is a membership website, and we help people transform their passion for the environment into a prosperous career. We take them from identifying what their green niche is, whether it’s being in business, going back to school, or getting a job, and then we give them the resources, the input from experts, and support to really help them achieve that goal. SR: You know, that’s a great title. Green Career Central. How did you come up with the idea for it, though? CM: Well, I was actually at a conference and struggling, because at the conference they kept saying, “Focus, focus, focus on one business direction,” and my business had always been split in two. I still remember many a night when I would be pulling out my hair, trying to figure out how to articulate my marketing message because I really had two pieces of myself. I had the “helping people change careers” part, and I had the “using nature to help them through life transitions” part. I just couldn’t figure out a good way to blend those. I was about to bail on the nature side of me, which is really what keeps me going, and my friend who was at the conference said, “But what if you combine the two and help people find their green career?” And I literally felt a bolt of energy run through my body, both up and down it. I’d never felt that before. It was just this recognition that finally, after 16 years in business, I found the thing that I had been training for all this time. It is literally taking everything I’ve ever done and putting it under one roof, with a clear marketing message that is getting attention. SR: The key that you said is that 16 years you’ve been in training for this. SR: And sometimes as entrepreneurs we think it’s got to happen right away. That’s not the case, is it? CM: Well, things happened! I wrote books, I did a lot of training of other coaches, which I still do, but there was some piece that wasn’t falling into place for me. And the marketing message was always the bugaboo that always got to me, because I could never have a clearly articulated statement about what I do. And that’s so critical, as you know. As a business owner, you’ve got to be able to say what you want to do in one sentence and have the people on the other side of that conversation get it. CM: Quickly, yes, and go, “Oh, I want to hear more!” And I’m now getting that on a regular basis on the Green Career Central site. SR: What this sounds like to me is that you’ve been a solo entrepreneur all this time, and now you’re really moving up into a much larger space – I would almost say a “world platform”. SR: What’s been the most important insight for you in this process? CM: The biggest insight has been “Oh my gosh, I can’t do it all!” So I have had to learn how to refocus my time on the strategic elements and on the elements that only I can do based on my 16 years of experience helping people change careers. I’ve got a lot of background and I need to leverage that. For all of the infrastructure and some of the research and writing some of the articles, I’ve built a team around me now to support me and the Green Career Central site. So this is much bigger than me, and that’s been a huge learning. SR: I’m sure it has! From solo entrepreneur to really becoming a much larger businessperson. SR: Well, we’re at the end of our interview, and we have five more questions we ask everyone. So here’s the first question: What one word describes your life today? SR: Aha. And what quality or characteristic is most important to you? SR: What turns you off? SR: And what inspires you? SR: Oh, I like that. Green Career Central. What’s the most precious thing you’ve learned along the journey from Accidental Pren-her to entrepreneurial woman? CM: To listen from the inside out. SR: That’s a very strong place to build a business. SR: Carol, once again, thank you for being on the Accidental Pren-her Show, and I know you’ve got a really special gift to share with all of our readers and listeners. Tell us first where they can find you at Green Career Central, and also a little about this special gift. CM: Okay! The website is http://www.greencareercentral.com. By signing up in the upper right hand corner for the newsletter, you also get a copy of our free report, “Six Strategies to Find Your Green Career”. In that e-book, we talk about the six steps to get there, but we also outline a number of green industries and some examples of jobs that are in those industries. It’s a really good starting point for people who want to find a way to transform their passion for the environment into a great career. SR: Indeed it is! Ladies and gentlemen, head on over to GreenCareerCentral.com go to that upper right hand corner, and click on “Six Strategies to Find Your Green Career”. It’s a phenomenal e-book. I have read so much stuff that Carol has written, so I know that this is going to be not only a valuable e-book for you to read, but also full of tons of insights and personal references. She also laces this with a really wonderful optimistic aspect. So head on over! Carol, thank you so much. CM: Thanks for having me! Carol, when you talk about screaming in your car, I have a visual of the highways jammed with people headed for work, screaming in their cars! We've all done it, I think. I love that you listened to the real message and followed your heart and your instincts. I also love to imagine the highways full of happy people, loving what they do every day. Then I start humming "Imagine." Hi Dana. Yes, I think there are many people voicing their displeasure at having to head into work each day. It's such a waste actually. Just as you've done...think of a world where everyone is doing what they are meant to do. So much angst would be eliminated! Carol: Your journey to starting your company is such a familiar struggle. I, too, took a "retreat" from my regular day to day, and did everything for myself during that time. It is amazing how that can be such an eye opening experience; to really listen to yourself! Your business really sounds like it will succeed with your concentration and focus. I enjoyed listening to your journey. Susan: As always and excellent interview and subject! Thank you, Moschel. The tuning in and listening to yourself experience is a powerful one. Our best work often arises from our time of communion with our inner self. That was certainly Carol's experience. And Dana and your experience, too. Moschel, your comment about retreating took me right back the feeling I had when I drove back from my beach retreat to face my job again! I remember feeling so connected to myself and NOT wanting to lose that! It was a powerful moment of recognition for me. Thanks for the memory! I appreciate your comments about my new venture too! It is very exciting to feel the focus building. I just went to visit your website, greencareercentral.com. WOW... so impressed with the resource you have created! I'm thrilled for you, Carol, because this direction so fits you to a TEE! I love how you've put your two loves together to create this. It just makes so much sense! I will definitely direct folks your way who are interested in and passionate(!) about "green". I agree -- isn't www.greencareercentral.com amazing! It perfectly suits you, Carol! Go check it out, everyone! Thanks Carol and Susan! The Green Career Central site is such a beautiful blend of what I've been doing since 1991. It's interesting to watch my career theme and my nature theme weaving together in new ways when I write and speak these days. The state of the green economy is offering new opportunities for so many people to green their work and business. Our mission is to help people find their way in this new green world. Thanks again for visiting our site and taking a look at what we are up to. For the full effect, take the tour on the site or check out our sample articles. Enjoy!